Twin sisters Pearl and Stasha are used with other “special” children at Auschwitz for Josef Mengele’s medical experiments. Told in the girls’ alternating voices, we follow them at the camp and after the liberation. Pearl disappears during a concert at the camp and Stasha searches for her in the unrecognizable and unimaginable landscape of Poland. The war may be over but the battle for survival is not. Amid incredible brutality Konar manages to convey a kind of humanity that is unexpected and a beautiful use of language and emotion that is heart-breaking and bizarrely uplifting. "One of the most harrowing, powerful, and imaginative books of the year" (Anthony Doerr) about twin sisters fighting to survive the evils of World War II. Pearl is in charge of: the sad, the good, the past. Stasha must care for: the funny, the future, the bad. It's 1944 when the twin sisters arrive at Auschwitz with their mother and grandfather. In their benighted new world, Pearl and Stasha Zagorski take refuge in their identical natures, comforting themselves with the private language and shared games of their childhood. As part of the experimental population of twins known as Mengele's Zoo, the girls experience privileges and horrors unknown to others, and they find themselves changed, stripped of the personalities they once shared, their identities altered by the burdens of guilt and pain. That winter, at a concert orchestrated by Mengele, Pearl disappears. Stasha grieves for her twin, but clings to the possibility that Pearl remains alive. When the camp is liberated by the Red Army, she and her companion Feliks--a boy bent on vengeance for his own lost twin--travel through Poland's devastation. Undeterred by injury, starvation, or the chaos around them, motivated by equal parts danger and hope, they encounter hostile villagers, Jewish resistance fighters, and fellow refugees, their quest enabled by the notion that Mengele may be captured and brought to justice within the ruins of the Warsaw Zoo. As the young survivors discover what has become of the world, they must try to imagine a future within it. A superbly crafted story, told in a voice as exquisite as it is boundlessly original, MISCHLING defies every expectation, traversing one of the darkest moments in human history to show us the way toward ethereal beauty, moral reckoning, and soaring hope. Affinity Konar was raised in California. She has an MFA in fiction from Columbia University. "Affinity Konar is an astonishing and fearless writer, whose great gift to us is this book. With incantatory magic, she marches through the most nightmarish of landscapes, swinging her light." "Mischling transported me to another world. It's a world that's part of our history, of course, and in a book that's so much about illusion, the true sleight of hand is that Affinity Konar allows us to see it anew. Brace yourself for a novel unlike any you've ever read." 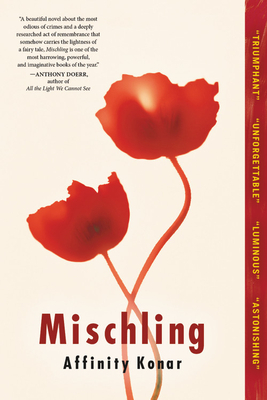 "Mischling is a phenomenal book--harrowing and heartbreaking, intimate and epic--and Affinity Konar is a wise and compassionate writer with talent in spades. An achingly beautiful novel that will stay with me for a long, long time." "This novel, haunted by history and the unknowable power of family, is made bearable--indeed, necessary--by the spectacle of a literary imagination that observes no limits. Konar has produced a tremendously unsettled work of art." "Konar makes every sentence count; it's to her credit that the girls never come across as simply victims: they're flawed, memorable characters trying to stay alive. This is a brutally beautiful book." "Fiction of rare poignancy--and astonishing hope.... An unforgettable sojourn of the spirit." "Konar's Mischling is a luminous tale of hope in the shadow of the Holocaust." "Astonishing. Complicated. Heartbreaking. Powerful. Devastating. Sublime.... A book for once deserving of those all too overwrought, overused descriptors." "A truly original story of the horrors of the Holocaust and life after." "Unflinching.... Konar constructs a sinuous plot from the chaos of the postwar landscape... It is certainly miraculous, and moving, that any of these victims survived, and Konar is wise to keep her focus not on the incomprehensibly sadistic Mengele in his shiny black boots, but on the children themselves." "Though Konar's work is fiction, her research into historical figures and accounts helped form the key characters and episodes within it. Her writing bears a pointed edge, but also has a striking cadence that is often beautiful and poetic." "A spare, stunning debut that's a must-read." "Drawn from the abundant documentation of the Holocaust, Konar's unbearable but transcendent debut novel imagines the ordeal of Jewish twins at the hands of the jovial sociopath they are asked to call "Uncle Doctor." In its blend of realism and fantasy, cruelty and beauty, the book itself affirms the value of mischling.... Konar's novel is filled with exquisitely crafted phrases...nevertheless, the aesthetic achievement of Mischling cannot redeem the world after Auschwitz. It merely illuminates it, woefully, brilliantly." "Konar's evocative storytelling, fierce characters and haunting prose make Mischling equally hard to put down." "A triumphant first novel.... In what could be the bleakest of worlds, Mischling gives us moments of transcendent hope and even beauty." "Full of rich historical detail, Mischling is a captivating story of survival in the worst circumstances imaginable.... Despite these atrocities, there is a mystical wonder present in the story--the world might be in blames, but the universe provides... It is hard to describe the alchemy that Konar performs to make this story so uplifting. "The sheer beauty of the language in Mischling is one of the things that makes the book unlike most other Holocaust novels." "There isn't a page in this novel that isn't also shining with hope and love, and that's what makes this beautiful book worth the read."